The Nurture and Support ministry cares for the physical, emotional, and spiritual needs of our congregation. Committees supporting this ministry include, Helping Hands, Funeral Receptions, Eucharistic Ministers, Stewardship, Hospitality, Prayer Ministry and gift based ministry. 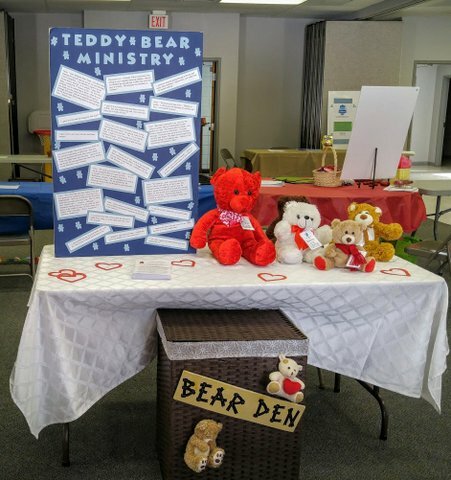 We would also like to spotlight our newest ministry, the Teddy Bear Ministry. Teddy Bears are located in the pews and anyone may take one of the bears to share with someone in need. This is a great way to reach out to people to share God’s love, care and comfort with those who are hurting for any reason. First Church has soft and cuddly teddy bears sitting in their pews. These same bears join us for worship on Sunday mornings, where on any given day you might see them being held or even sitting on the laps of the people gathered. In loving memory of John Gray, First Church has begun a new ministry that allows people to share God's love in a different way; through the gift of a teddy bear. Every week bears line our pews as they join us for worship. While there they soak in God's love as well as the love of our congregation. But surprisingly, our bears don't stay around very long. Every week people are encouraged to take these soft, cuddly friends out into their everyday lives to be shared with those who might be in need of love. Think about it. We all know people who are going through difficult and challenging times, people who need to be reminded that someone cares and is thinking about them. Our small little friends seem to accoomplish just that. Each bear wears a tag that simply syas: "This bear has been among the congregation of First Lutheran Church. It has heard the Word read, prayers prayed, praises sung, and sermons preached. It has been loved by First Lutheran and has soaked in God's love. Now it comes to you with blessings of worship and love."